Daniel Negreanu is enjoying the best year of his poker career. Having won a pair of World Series of Poker bracelets and made handful of major final tables in 2013, “Kid Poker” has more than $3 million in tourney earnings this year alone while locking up the WSOP Player of the Year award, becoming the first player ever to win the honor twice. Negreanu will admit that many aspects of his no-limit hold’em game have changed — or evolved — over the years. But many of his techniques have remained the same, including his incorporation of small suited connectors and suited gappers. Hands like and can be a sneaky and profitable weapons in no-limit hold’em if played correctly. Hitting a big flop with these hands can result in a big payoff, especially against an unsuspecting opponent who is holding a big pair. We recently witnessed a hand at the European Poker Tour Barcelona €10,300 High Roller in which Negreanu played a suited gapper aggressively out of position to win a big pot against German pro Philipp Gruissem. While we wouldn't necessarily advise a beginner to take this approach, it is a play you may want to add to your arsenal later on to keep your opponents constantly guessing what you’re holding. This hand took place late on Day 1 of the three-day event. The blinds were 2,000/4,000 with an ante of 500. Negreanu had just over 400,000 to start the hand while Gruissem had a little more than 200,000, meaning both had relatively “deep” stacks since the blinds were still quite low. Negreanu began the hand with a raise to 9,000 from under the gun (first position) with , and Philipp Gruissem called from the big blind. The flop came and Gruissem checked. Negreanu decided to check behind with his flush draw. The turn was the and Gruissem checked again. 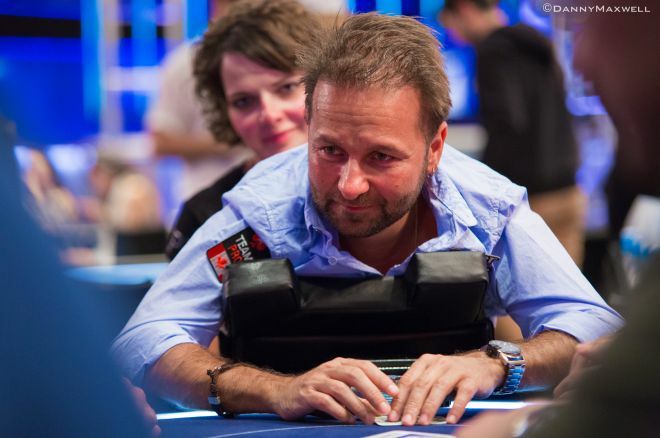 Negreanu bet 30,000 with his draw and Gruissem tossed in the call. Preflop: Negreanu was the first to act preflop, and he put in a small raise to 9,000 — a little more than two times the big blind — with his . Now, is -suited a hand you want to be raising with in your home game from early position? Probably not. Negreanu has always taught that beginners need to be careful when playing these types of hands out of position. But while small suited connectors and suited gappers can be dangerous, Negreanu also knows the value of mixing up his play in a big tournament such as this one. If he's only raising with big cards from early position, his game can easily be exploited by top-level players. He needs to keep them guessing by balancing his range. That means if Negreanu plays a variety of hands the same way in the same situation, his range of hands is balanced. Thus, his opponents are going to find it difficult to put him on a hand. The Flop: The flop came , giving Negreanu a flush draw with his . It was extremely unlikely that Negreanu had the best hand with five-high, of course, but he now had nine outs to make a flush. Rather than betting, though, Daniel elected to check behind Gruissem on the flop, most likely (1) to control the size of the pot, and (2) to disguise the strength of his hand. The Turn: Negreanu didn't improve when the hit the turn, but Gruissem wasn't showing any strength by checking for a second time. Negreanu decided to take a stab at the pot with a semi-bluff. Unlike a pure bluff in which a player can only win if his opponent folds, a semi-bluff gives Negreanu two chances to win the pot — if his opponent folds or if he makes his hand on the river. Here Gruissem called, and the pair watched the last community card fall. The River: The on fifth street completed Negreanu's flush, and this is where his sneaky check on the flop paid off. Gruissem might have thought that Negreanu would have bet a flush draw on the flop. In the end, he paid off Negreanu's river bet and was frustrated to see Negreanu's hand. Small suited connectors and suited gappers can be your best friend or your worst enemy, but this hand provides a good example of how to win with such hands without getting yourself into trouble. Playing these hands involves trying to maximize your winnings and minimize your losses while always keeping your opponents on their toes. Negreanu has mastered the execution. Is Arriving Late to a Tournament a Good or Bad Idea?